On Palm Sunday suicide bombers struck hours apart at two Coptic churches in northern Egypt, killing 44 people, injuring hundreds more and turning Palm Sunday services into scenes of horror and outrage. The Coptic church is the earliest Christian presence in Egypt going back to the year 100. What are we to make of such horrific events? Is there any room for hope? What is this way of peace that Jesus speaks of? Christianity teaches that three days later on Easter morning, the risen Christ was seen and touched. Whether you take this metaphorically or literally, the Easter story affirms this truth: That neither violence, fear or even death will have the last word…On that first Easter love expressed in forgiveness had and has the final word. It’s been said: ‘We are called to be Easter people, living in a Good Friday world’. Whether you are Christian or not we are invited to claim the truth that evil never wins. 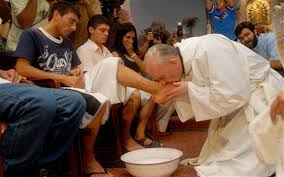 We think of Pope Francis washing the feet of homeless children (Muslim and Christian) in Rome. A reminder that love has no boundaries, no limits. Each of us are invited, challenged to put love into practice. To offer an alternative to retribution and fear. What forgiveness are we prepared to offer? Who are you and I called to embrace? What stranger are we called to befriend? In time, ISIS and the Assad’s of the world will be a footnote of history. But the story of love’s capacity to persevere and show us the way will continue to be told. This Holy Week let us pray for our Muslim and Christian sisters and brothers in Syria. Let our hearts rest with our Coptic family under siege. May our Jewish friends be blessed as they walk through Passover. Let us Rise Up in Love. Immigrants, Refugees and Undocumented, Oh My!